Stupid question of the day (probably of the week for that matter), and I apologize if this is in the wrong forum. Wasn't sure if I should post it here or in General Discussions (Mechanics won out). As you straddle your bike and look down at your front wheel, which side of the fork (and please don't say "outside" LOL), should the QR lever be on, the left or right? Or does it really matter? Left, to stay consistent with the rear, where the derailleur is on the right. Tradition says the left (non-drive) side, but in practice it doesn't matter. +1, It really doesn't matter on the front, but might as well keep it on the left to match the rear. Rear levers almost always have to be on the left because of clearance issues with the RD upper body. Likewise clearance should be the guiding factor in front. In most cases there won't be any issue, so left it is. But in the rare event a fender brace or front rack leg is in the way, feel free to abandon consistency in favor of ease of use. Also feel free to have the QR lever on the right if something like a hand injury makes it easier for you that way. Just learn to ignore all those "your front QR is backward" comments you're likely to draw. Sometimes drive side's OK on the rear also. As mentioned traditional lever placement is on the LH side, ft and rr. But with disk brakes many will put the levers on the non rotor side, the RH side. It doesn't really matter. Andy. Thanks for the replies everyone, I really appreciate the info. Guys used to put the front one on the right and situate the release lever close behind the fork leg to make it a little less likely to get hung up in someone else's spokes in an accident. I always thought that was a "stretch" so I didn't do it that way. I'll bite--why is the lever on the right hand side close behind the fork leg less likely to get hung up on somebody else's spokes than a lever on the left side close behind the fork leg? Because you can't arrange it that way on the left. Look at your front wheel and you'll see the flag cannot be positioned vertically behind the fork blade, only in front of it. On the right you can set it vertically behind the fork leg. Does it make any difference or contribute to safety? Well, the next time you hear a real instance of a qr flag getting caught in someone else's spokes, let me know. Note that this only apples to an internal cam QR unit with the lever offset from the centerline. The central levers of external cam and some like old school Simplex, or Mavic skewers don't care. Also, when the major makers curved the levers in response to CPSC rules (40+ years ago), the issue if snagging a skewer went away. Most of us were very happy to close the lever forward of an parallel to the fork blade, and I don't know of any case of getting one snagged and opened. actually, I've always been under the impression that the lever was supposed to be pointing backwards, so that if you ride too close and snag a bush or twig or something, it would not open the lever. BITD, when the likes of Coppi and Eddie Mercxx were riding the QRs were closed as you asked, Parallel to the ground and pointing back. 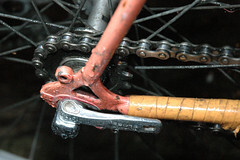 Some free thinkers, closed the rear skewer upside down and pointing forward below the rear dropout. Once they were curved ti meet CPSC requirements, a new style evolved and the upside down/forward arrangement become dominant, and the front was closed forward and paallel, with the blade itself protecting it. Whenever I teach about QR's, I don't get into specific "right" ways, but instead tell people to close the lever so it's near a frame part for security, but not directly over it so that they can easily get their fingers behind when time comes to open it. I close my road bike's Campy internal skewers as I described, pointing forward in back, and up in front of the fork. But I close the rear external cam skewer on the commuter across the dropout and into the gap between the chain and seat stays. To anyone wanting to know the "right" way, I still say, whatever works best for you, balancing security and ease of use, just don't jam it against the tubes, so you need a crowbar to get it open. Last edited by FBinNY; 12-05-14 at 10:23 PM.